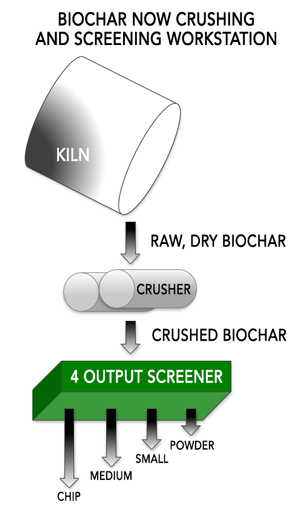 When the biochar conversion process is finished, the raw biochar pieces are too large for practical use so they are resized at a crushing and screening workstation. The output produces four sizes – Chip, Medium, Small and Powder. Each size has its own uses as seen in the table below. 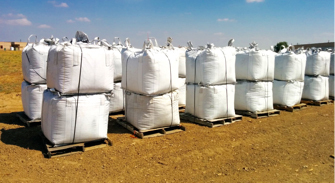 After sizing, the biochar is packaged in either one cubic foot plastic bags or one cubic yard super sacks (FYI there are 27 cubic feet in one cubic yard). Biochar Now has negotiated national discount rates with major carriers. UPS and FedEx handle the company’s small shipments. LTL carriers (partial truck loads) manage the medium sized loads and semi-tractor trailers handle the large shipments (up to 72 cubic yards per trailer). Freight rates flow through to the buyer. "See the Biochar Size Selection Table"